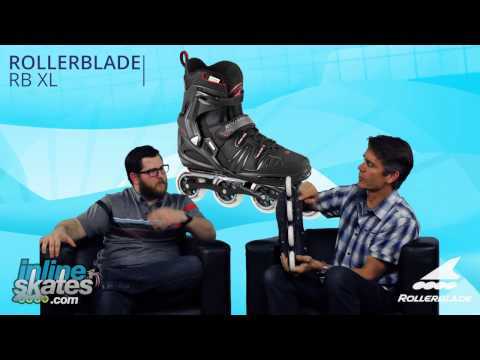 Brand new for 2012 the Rollerblade RB XL was designed for the skater with big feet. Fitting sizes 14 to 17.5 if you have big feet and always wanted to go inline skating you are now able to. The RB XL provides comfort, support and performance for big and tall men. The Training 5 Star Fit liner will keep your feet feeling very good. The 90mm wheels with SG5 bearings give you a smooth and solid roll that will provide you hours of inline skating fun. 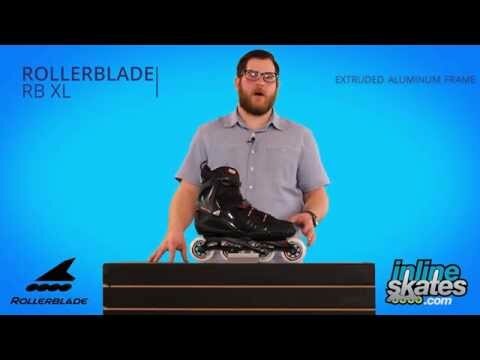 These skates are also very stable with a cuff buckle, powerstrap and laces to give you the confidence you need to succeed in inline skating. Ive have size 14 feet. 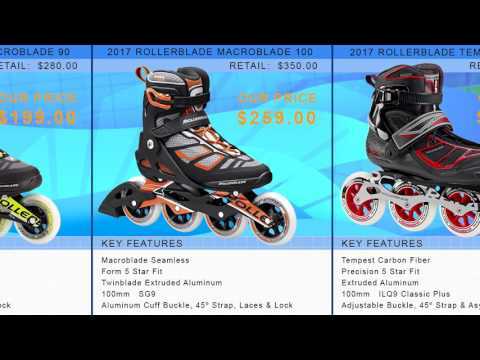 Ive tried finding Rollerblades for years so I was super excited when the larger sizes finally became available. They are great blades and proportional in every way. I use them for exercise and they are great. Q: Are you gonna have these in size 14 or 14.5 soon? A: We have the 2018 model in size 14.5 currently and we can look into ordering the 2018 model in size 14 as well. This is the previous year model and we most likely will not be receiving more stock in this specific model. We also have the K2 F.I.T. 80 Boa, K2 F.I.T. 84 Boa, and the K2 VO2 100X available in a size 14. A: Currently the RB XL Is the only skate available in a size 15. We don't currently have this model of the RB XL in the size 15 since this is last season's model and is sold out in that size. We do have the current season's model available in a size 15 which can be seen by searching RB XL in the top site search bar. Unfortunately it's rare that any other model of skate is available at this large of a size so the selection is minimal, the RB XL does have a great boot setup and the frames are spaced at 195 mm meaning you could upgrade or change the frames so customization is an option. Best luck to you! Q: Are the mounting bolt holes for the frames a standard distance apart so that other frames could be mounted. A: The frame spacing the RB XL Is 195mm so most all race style frames will work with them. Q: I'm a size 16 EEEE shoe. What size would you recommend? A: I'd be slightly worried about the length since these are XL skates but not necessarily extra wide to the extent of EEEE. You could go with the 16.5 or 17 to ensure you have some room in the skate to add a heel lift or an aftermarket footbed. The heel lift will most likely be your best bet as this will pull your foot up in the skate alleviating some of the side to side pressure. I've outfitted several skaters over the years with wide feet and the heel lift seems to work pretty much every time. The skates also will break in slightly over time, and the softer boot design will also help. A: No inline skate manufacturer currently posts weight limits/restrictions to their skates so there isn't a set in stone limit. You will want to go with a slightly nicer model like this one with a nicer boot and an aluminum frame. A stiffer boot and an aluminum frame is what to look for when shopping. Q: I wear size 14 shoes but have narrow feet. Will these be too wide fr me, are there any other options? A: There aren't any inline skate manufacturers that really run more narrow than another but inline skates are not super wide. You may have to purchase an aftermarket footbed or insert but the skates shouldn't have you swimming in them. I have outfitted skaters that have a narrower foot and just by adding a more padded footbed they typically find that the fit works for them. You could always go with the Guaranteed fit program and purchase a size 13/13.5 along with the 14, try them all on and then return the sizes that don't fit. For more information on the Guaranteed fit program please search Guaranteed Fit Program in the top site search bar. Q: I wear a size 15 (33 cm) wide in mens us I have and was wondering if I should go up to 15.5 or a 16. A: Going up the 1/2 size to the 15.5 should suffice for your wide foot. I wouldn't really recommend going any bigger since you still want a pretty snug fit to ward off blisters. Q: I currently wear a 14 EE shoe and weigh 270#. Would a 15 be my best option? A: Yes, these are approximately my measurements (14 EE and 275 lbs) and I use the Rollerblade RB XL's in a 15 and they provide a perfect fit. Q: Hi, Is a brake included ? Many thanks in advance for your answer. 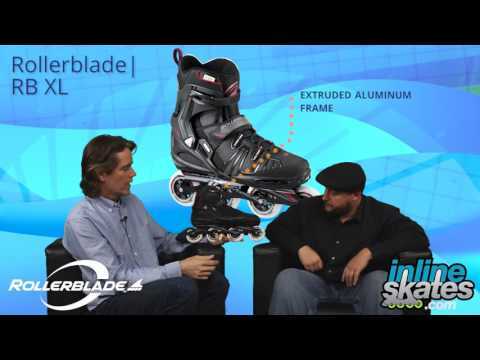 A: Yes, the Rollerblade RB XL's will come with a brake in box that can be attached.